Koichi Domoto(堂本 光一,Dōmoto Kōichi, born January 1, 1979) is a Japanese idol, singer, singer-songwriter, composer, lyricist, television personality, voice actor and actor. Along with Tsuyoshi Domoto (with whom he has no blood-relation), he is a member of KinKi Kids, which is a Japanese duo under the management of Johnny & Associates. Ashiya is a city in Hyōgo Prefecture, Japan, between the cities of Nishinomiya and Kobe. The city was founded on November 10, 1940. Sushi Ōji! (スシ王子!) is an original Japanese television drama series directed by Tsutsumi Yukihiko (堤幸彦) with main lead played by Domoto Koichi of KinKi Kids. It aired on Friday nights for a total of 8 episodes, from July 27 - September 14, 2007. Yūichi Nakamaru, is a Japanese idol, singer-songwriter, actor, television personality, radio host, and a member of KAT-TUN. KAT-TUN is a Japanese boy band formed under Johnny & Associates (Johnny's) in 2001. The group's name was originally an acronym based on the first letter of each member's family name: Kazuya Kamenashi, Jin Akanishi, Junnosuke Taguchi, Koki Tanaka, Tatsuya Ueda, and Yuichi Nakamaru. Their debut on March 22, 2006 was marked by a tripartite release of a CD single, album and music DVD on their exclusive record label J-One Records. Since then, all of their single, album and music DVD releases have debuted at number one on the Oricon music and DVD charts. 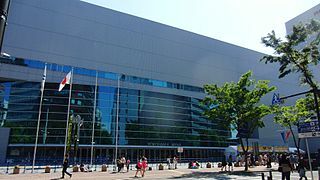 "Danger Zone (To the Unknown World)"
KOICHI DOMOTO Concert Tour 2012"Gravity"
For activities as a member of KinKi Kids, please refer to KinKi Kids. Tokyo Broadcasting System Holdings, Inc., TBS Holdings, Inc. or TBSHD, is a stockholding company in Tokyo, Japan. It is a parent company of a television network named Tokyo Broadcasting System Television, Inc. and radio network named TBS Radio & Communications, Inc. (株式会社TBSラジオ&コミュニケーションズ). TV Asahi Corporation, also known as EX and Tele-Asa, is a Japanese television network with its headquarters in Roppongi, Minato, Tokyo, Japan. The company also owns All-Nippon News Network. ↑ Position was taken from 2006 week 39 for Mirror, 2010 week 38 for BPM, 2012 week 42 for Gravity. ↑ Position was taken from 2006 week 6 for Endless Shock. ↑ Position was taken from 2008 week 19 for "No More," 2009 week 33 for "Ayakashi." ↑ Under the name Tsukasa Maizu(米寿司,Maizu Tsukasa) for the film Sushi Ōji!. Yuki Kuramochi, known professionally as Yuki, is a Japanese musician and singer-songwriter. She is best known as the lead vocalist for Judy and Mary. She founded Judy and Mary in 1991 and became a solo artist in 2002. She has also been a member of the bands NiNa and Mean Machine. Greeeen is a Japanese pop rock/hip hop/breakbeat vocal group from Kōriyama in Fukushima Prefecture, comprising the all-male four members Hide, Navi, Kuni, and Soh. They made their debut with Universal Music in 2007. Their logo image is of a mouthful of teeth, and the four Es indicate the number of members. The sound production is handled by Hide's older brother JIN, a former guitarist of Pay money To my Pain. According to their website at Universal Music Japan, their catch phrase is "Rock 'n' Breakbeats with Four Microphones". The discography for Japanese boy band KAT-TUN. This is the discography of Ayaka Hirahara. The discography of Japanese group KinKi Kids consists of 13 studio albums, four compilation albums, 20 video albums and 33 singles. All of KinKi Kids' studio albums and singles have reached number one in Japan on Oricon charts, as of 2013. All of their music has been released by Johnny's Entertainment in Japan. In Taiwan, Kinki Kids' music has been released under Forward Music from 1997 to 2000, Skyhigh Entertainment and What's Music in 2001, and Avex Taiwan from 2002 to the present. Phi is the tenth studio album of the Japanese duo KinKi Kids. It is the first album by KinKi Kids to have a Greek-lettered title, rather than the traditional Latin-lettered album title. The album was certified platinum by the RIAJ for 250,000 copies shipped to stores in Japan. The Japanese boyband Kanjani Eight is a pop idol group managed by Johnny & Associates and works released by Infinity Records. The group, currently, has a total of 36 released singles, 9 studio albums, one mini album, and fifteen DVD releases. Thirty three of thirty six singles have placed at number-one on the Oricon singles chart. 47, the concert DVD for their 2007 nationwide tour, was the top selling music DVD of 2008. The discography of Monkey Majik consists of eleven studio albums, five compilation albums and numerous singles and digital downloads. The band's releases were originally self-released in Sendai, after which they were signed to independent label and management Under Horse Records, and released material through there between 2004 and 2005. In 2005, Monkey Majik were signed to major label Avex Entertainment, and continue to release under the Binyl Records sub-label. The discography of Hey! Say! JUMP features six studio albums, twenty-five singles and thirty-eight music videos, all released through J Storm. The group activities started when the temporary five-member group Hey! Say! 7 were put together to provide the theme song for the anime Lovely Complex. The original members were Yuya Takaki, Daiki Arioka, Ryosuke Yamada, Yuto Nakajima, Yuri Chinen. The five Hey! Say! 7 members were later joined by another four idols, Kota Yabu, Kei Inoo, Hikaru Yaotome and Keito Okamoto, thus creating the group Hey! Say! JUMP, the agency's largest group in history. The group made their CD debut through "Ultra Music Power" which topped the Oricon singles chart. Hey! Say! JUMP released their first full length studio album, JUMP No. 1 on July 7, 2010. Super Modern Artistic Performance is the eighteenth studio album of Japanese boy band SMAP, released on September 24, 2008 by Victor Entertainment in Japan. The album features work from Japanese-Canadian pop-rock band Monkey Majik, Korean singer-songwriter Park Jin-young, Japanese electronic musician and Capsule member Yasutaka Nakata and Black Eyed Peas member will.i.am. The album debuted and peaked at number one in the Oricon Weekly Charts with 214,000 units sold on its first week of release and is certified Platinum by the RIAJ. This has made SMAP achieved total album sales of ten million, being the second musical group of vocalists after Chage and Aska to achieve the sales total. The discography of M-Flo features eight studio albums, nine compilation albums, one live album and 25 singles. These were released on Labsoul Records and Avex Group independent label Rhythm Republic in 1998, and from 1999 onwards released through Rhythm Zone. The discography of Japanese boy band SMAP consists of 21 studio albums, 5 compilation albums, 23 video albums, and numerous singles. Sports Music Assemble People, abbreviated as SMAP, was formed in 1988 by a group of backup dancers for the boy band Hikaru Genji of Johnny & Associates. The band's initial releases performed poorly on the charts, but the following ones started gaining attention, aided by the group's appearance on their own variety show, SMAP×SMAP. Their 2003 single "Sekai ni Hitotsu Dake no Hana" sold over two million copies in Japan, becoming one of the best-selling singles in the country. In August 2016, the group announced that they will disband by the year end. Since 2003, all of the band's releases have peaked at number one on the Oricon Albums or Singles Chart. The group has sold over 35 million records in Japan. ↑ "Koichi Domoto to star in first drama series in 5 years". Tokyograph. February 28, 2007. Retrieved November 1, 2009. 1 2 "'Sushi Ouji' film announced before TV series starts". Tokyograph. June 5, 2007. Retrieved November 1, 2009. ↑ "Koichi Domoto sings for "Sushi Ouji!"". Tokyograph. January 16, 2008. Retrieved November 1, 2009. ↑ ""Endless Shock" wins Kazuo Kikuta Award". Tokyograph. April 22, 2008. Retrieved November 1, 2009. ↑ "The "Sushi Prince" goes to New York". Tokyograph. April 30, 2008. Retrieved November 1, 2009. ↑ "Charts: Koichi Domoto, Coming Century". Tokyograph. August 5, 2009. Retrieved November 1, 2009. ↑ "Koichi Domoto's "Endless SHOCK" aims for U.S." Tokyograph. 2010-07-31. Retrieved 2010-08-06. 1 2 3 "オリコンランキング情報サービス「you大樹」" [Oricon Ranking Information Service 'You Big Tree']. Oricon . Retrieved March 18, 2014. (Subscription required (help)). 1 2 3 4 5 "堂本剛のリリース一覧" [A Look at Tsuyoshi Domoto's Releases]. Oricon . Retrieved March 18, 2014. 1 2 3 "G-Music Combo Chart" (in Chinese). G-Music. Archived from the original on October 13, 2007. Retrieved March 18, 2014. 1 2 3 "G-Music J-Pop Chart" (in Chinese). G-Music. Archived from the original on May 8, 2011. Retrieved February 13, 2014. ↑ "堂本光一、初のオリジナル・ソロアルバムが初登場首位に！". ORICON NEWS (in Japanese). Retrieved 2018-04-01. ↑ ゴールド等認定作品一覧　2006年9月 [Works Receiving Certifications List (Gold, etc) (September 2006)]. RIAJ (in Japanese). October 10, 2006. Retrieved February 13, 2014. ↑ ゴールド等認定作品一覧　2010年9月 [Works Receiving Certifications List (Gold, etc) (September 2009)]. RIAJ (in Japanese). October 10, 2011. Retrieved February 9, 2014. ↑ "【オリコン】堂本光一、ソロ6年ぶりのアルバム首位". ORICON NEWS (in Japanese). Retrieved 2018-04-01. ↑ ゴールド等認定作品一覧　2012年10月 [Works Receiving Certifications List (Gold, etc) (October 2012)]. RIAJ (in Japanese). November 10, 2012. Retrieved January 1, 2014. ↑ "堂本光一、ソロ初の首位！ミュージカル・サントラによる首位は史上初！". ORICON NEWS (in Japanese). Retrieved 2018-04-01. ↑ ゴールド等認定作品一覧　2006年1月 [Works Receiving Certifications List (Gold, etc) (January 2006)]. RIAJ (in Japanese). February 10, 2006. Retrieved December 23, 2013. ↑ "【オリコン】堂本光一、主演舞台サントラ第2弾がアルバム首位　1500回上演に華". ORICON NEWS (in Japanese). Retrieved 2018-04-01. ↑ 週間　CDアルバムランキング 2017年04月17日～2017年04月23日） [CD album Daily ranking from April 17, 2017 to April 23, 2017] (in Japanese). Oricon. Archived from the original on April 26, 2017. Retrieved April 26, 2017. 1 2 "Hot 100｜JAPAN Charts｜Billboard JAPAN" (in Japanese). Billboard. ↑ "Japan Billboard Hot 100 2008/05/12". Billboard (in Japanese). May 12, 2008. Retrieved March 18, 2014. ↑ "Japan Billboard Hot 100 2009/08/10". Billboard (in Japanese). August 10, 2009. Retrieved March 18, 2014. ↑ ゴールド等認定作品一覧　2006年8月 [Works Receiving Certifications List (Gold, etc) (August 2006)]. RIAJ (in Japanese). September 10, 2006. Retrieved December 31, 2013. ↑ ゴールド等認定作品一覧　2008年4月 [Works Receiving Certifications List (Gold, etc) (April 2008)]. RIAJ (in Japanese). May 10, 2008. Archived from the original on August 20, 2009. Retrieved February 9, 2014. ↑ ゴールド等認定作品一覧　2009年7月 [Works Receiving Certifications List (Gold, etc) (July 2009)]. RIAJ (in Japanese). August 10, 2009. Retrieved January 1, 2014. ↑ "【オリコン】堂本光一、男性ソロ歴代1位記録を更新". ORICON NEWS (in Japanese). Retrieved 2018-04-01. ↑ "Japan Billboard Hot 100 2013/09/13". Billboard (in Japanese). September 13, 2013. Retrieved March 18, 2014. ↑ "Japan Billboard Hot 100 2012/10/15". Billboard (in Japanese). October 15, 2012. Retrieved March 18, 2014. ↑ "堂本光一がDVDチャート首位に！". ORICON NEWS (in Japanese). Retrieved 2018-04-01. ↑ ゴールド等認定作品一覧　2004年10月 [Works Receiving Certifications List (Gold, etc) (October 2004)]. RIAJ (in Japanese). November 10, 2004. Retrieved January 23, 2014. ↑ ゴールド等認定作品一覧　2007年5月 [Works Receiving Certifications List (Gold, etc) (May 2007)]. RIAJ (in Japanese). June 10, 2007. Retrieved February 13, 2014. ↑ "【オリコン】堂本光一、BDで男性ソロ2冠". ORICON NEWS (in Japanese). Retrieved 2018-04-01. ↑ ゴールド等認定作品一覧　2011年3月 [Works Receiving Certifications List (Gold, etc) (March 2011)]. RIAJ (in Japanese). April 10, 2011. Retrieved December 31, 2013. ↑ "【オリコン】堂本光一、ソロ歌手初のDVD7作連続首位～宇多田の記録を11年ぶり更新". ORICON NEWS (in Japanese). Retrieved 2018-04-01. 1 2 "【オリコン】堂本光一、ソロ初の3作連続DVD＆BD同時首位". ORICON NEWS (in Japanese). Retrieved 2018-04-01. 1 2 "SANSPO.COM". 2002-10-03. Retrieved 2018-04-01. ↑ "DVDランキング、堂本光一が総合と音楽を制覇！！". ORICON NEWS (in Japanese). Retrieved 2018-04-01. ↑ ゴールド等認定作品一覧　2006年2月 [Works Receiving Certifications List (Gold, etc) (February 2006)]. RIAJ (in Japanese). March 10, 2006. Retrieved January 22, 2014. ↑ "EXILEATSUSHI、堂本光一以来1年半ぶり男性ソロ音楽DVD首位". ORICON NEWS (in Japanese). Retrieved 2018-04-01. ↑ ゴールド等認定作品一覧　2008年10月 [Works Receiving Certifications List (Gold, etc) (October 2010)]. RIAJ (in Japanese). November 10, 2010. Retrieved January 1, 2014. ↑ "【オリコン】堂本光一、主演ミュージカルのドキュメントDVDで6作連続首位". ORICON NEWS (in Japanese). Retrieved 2018-04-01. 1 2 "【オリコン】堂本光一、映像ランキング歴代記録2冠". ORICON NEWS (in Japanese). Retrieved 2018-04-01. ↑ "帝国劇場 ミュージカル『ナイツ･テイルー騎士物語ー』". www.tohostage.com. Retrieved 2018-04-01. ↑ "堂本光一、ソロライブでＦ１可夢偉絶賛 - 芸能 - SANSPO.COM". 2010-10-15. Retrieved 2018-04-03. ↑ "お知らせ：光一の初著書続編は１４日発売". f1express.cnc.ne.jp (in Japanese). Retrieved 2018-04-03. ↑ Inc., Natasha,. "堂本光一、F1尽くしの著書「僕が1人のファンになる時 2」 - 音楽ナタリー". 音楽ナタリー (in Japanese). Retrieved 2018-04-03. ↑ "堂本光一、著書発売で「ジャニーズイズム」「センター論」語る". マイナビニュース (in Japanese). Retrieved 2018-04-03. ↑ Inc., Natasha,. "堂本光一の連載「エンタテイナーの条件」書籍化、制作現場も大公開 - 音楽ナタリー". 音楽ナタリー (in Japanese). Retrieved 2018-04-03. ↑ "光一コラム復活！今年のＦ１を語る｜マッチRACE＆光速CORNER｜F1 EXPRESS　トーチュウ". f1express.cnc.ne.jp (in Japanese). Retrieved 2018-04-03. ↑ "日経エンタテインメント！ on Twitter". Twitter. Retrieved 2018-04-03. ↑ "Johnny's net". archive.is. 2016-12-15. Retrieved 2018-04-03. ↑ "Johnny's net". www.johnnys-net.jp (in Japanese). Retrieved 2018-04-03. ↑ "Drama Academy Awards". Tokyograph. Archived from the original on January 29, 2010. Retrieved November 2, 2009. ↑ ザテレビジョン　ドラマアカデミー賞: 【第35回 助演男優賞】堂本光一 (in Japanese). Television Drama Academy Awards. January 29, 2003. Retrieved November 2, 2009. ↑ "菊田一夫演劇賞のあゆみ". www.tohostage.com. Retrieved 2018-04-01.